Years ago, my sister subscribed to Glamour magazine and I noticed illustrations every month that I loved! So when she was done with each issue I’d tear out all the pages that had illustrations on them and kept them in a folder. I loved the simples lines of each image, but that they still contained so much detail. The characters always looked like they were having so much fun! 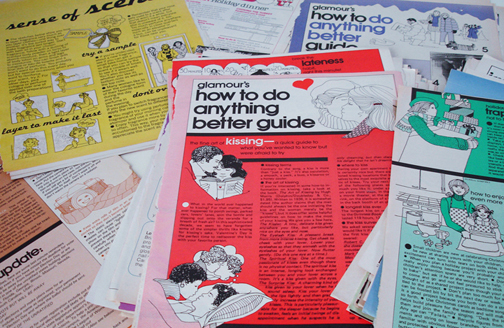 Most of the illustrations were in a section in the middle of each issue that was called “How To Do Anything Better Guide.” Durell Godfrey was the illustrator’s name. I enjoyed just looking at the illustrations, but also tried to mimic the style when sketching and drawing. Fast forward to a few months ago. I decided to finally try to use Facebook a bit more and was looking up random people. I don’t know why, but Durell Godfrey’s name popped into my head so I typed it in the search and someone came up! It’s such a unique name and figured it had to be the same person, but sent a message and asked. It was her! She was extremely friendly and nice. We exchanged a few messages and I learned more about her, and how she concentrates on photography now. Not only is she a great illustrator, but takes fantastic photos as well! Wow, I can’t tell you how excited I was! I had stared at all those pictures in that file folder for years and still have them to this day! The same week I found Durell on Facebook, I was out shopping and a top caught my eye. Totally not my style and maybe even a bit 80’s disco influenced. It had silver metallic tubes that gathered the straps on the front and the material was very slinky. I tried it on and it looked okay, but again…not my style. So I passed. I also saw a *very* 80s looking striped knit dress. I held it up and chuckled a little then put it back. Ding! 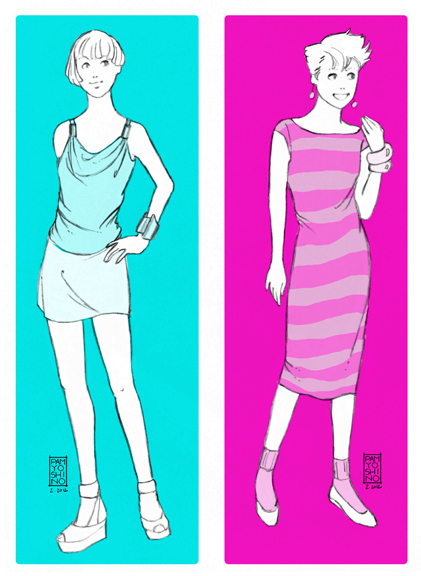 I decided to do illos of the top and dress, but try to do it in Durell’s style to keep that 80s vibe going. Heh heh…I didn’t point it out, but it’s an “artist’s rendering” of me in the top I described. By “artist’s rendering” I mean that I can be as tall and skinny and model-like as I want! Hi Karen! I’m so glad you happened to find my post about her! I think it’s great that we both enjoy her work so much, that we’ve kept some of her illustrations!